John Oliver, host of HBO's Emmy-winning Last Week Tonight, publicly confronted Oscar-winner Dustin Hoffman about recent sexual harassment allegations made against him. 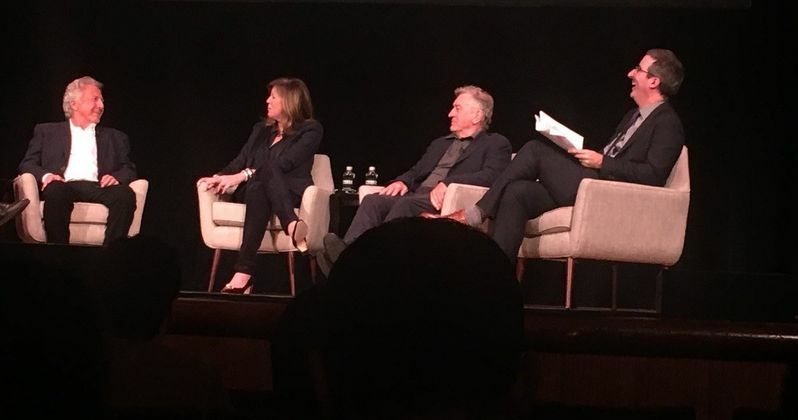 Oliver was moderating a panel and screening with Hoffman, Robert De Niro, producer Jane Rosenthal and director Barry Levinson, in honor of the 20th anniversary of Wag the Dog. During the panel, Oliver said, "This is something we're going to have to talk about because ... it's hanging in the air." Hoffman replied and, for the rest of the evening, it was a back and forth between the two. "It's hanging in the air? From a few things you've read you've made an incredible assumption about me. You've made the case better than anyone else can. I'm guilty." Dustin Hoffman was recently accused by Anna Graham Hunter of sexually harassing her in 1985 while filming of the Death of a Salesman TV movie was taking place. At the time, she was just 17-years-old. Hoffman has distanced himself from the accusations and, during the exchange with John Oliver, he says he still doesn't know who she is. "I still don't know who this woman is. I never met her; if I met her it was in concert with other people." At one point, Dustin Hoffman tried to defend himself by saying, "You weren't there." John Oliver then said, "I'm happy I wasn't." Oliver didn't let up as things progressed. He called into question Dustin Hoffman's response to the allegations. In his response, Hoffman said that the accusations made were "not reflective" of who he is. Oliver jumped on that, calling the actor out for not having provided any evidence to show the harassment didn't happen. "It's 'not reflective of who I am,' it's that kind of response to this stuff that pisses me off. It is reflective of who you were. If you've given no evidence to show it didn't [happen] then there was a period of time for a while when you were a creeper around women. It feels like a cop-out to say 'it wasn't me.' Do you understand how that feels like a dismissal?" Reportedly, John Oliver and others on the panel would try to move away from the topic, but they kept circling back. At one point, Dustin Hoffman asked Oliver, "Do you believe this stuff you read?" To which, he replied, "Yes. Because there's no point in [an accuser] lying." The exchange continued, with Hoffman saying, "Well, there's a point in her not bringing it up for 40 years." Oliver then disapprovingly replied with, "Oh Dustin," then proceeded to put his head on his hand. Barry Levinson, at one point, jumped in to try and defuse things with his own take. "You also have the way men and women worked together [in the past]; you are in a situation where 'that was then, this is now. [And] what difference is all this going to make?...This conversation doesn't do any good. We have a platform here. How are we moving [the issue] forward?" John Oliver replied with, "This isn't fun for me. [But] there's an elephant in the room because, this particular incident, a conversation has not been had." Oliver noted that "Wag the Dog" dealt with sexual harassment by a powerful man, to which Barry Levinson replied, "It wasn't produced by Weinstein or Miramax...Kevin Spacey wasn't starring in it. Let's look at real sexual criminal predators." Oliver was not impressed with that line of reasoning. The accusations made against Dustin Hoffman by Anna Graham Hunter have been the most prevalent, but he's had other accusations made. Writer Wendy Riss Gatsiounis claims that the actor acted inappropriately towards her during a pitch meeting in 1991 and Katharine Ross, his co-star in The Graduate, claims to have been groped by Hoffman. Here's Hoffman's full response following the Hunter allegations. "I have the utmost respect for women and feel terrible that anything I might have done could have put her in an uncomfortable situation. I am sorry. It is not reflective of who I am." Sexual misconduct and harassment has been a huge topic in Hollywood of late, following the massive Harvey Weinstein scandal. Dustin Hoffman is just one of many to have been accused of misconduct in recent months, in addition to Matt Lauer, Charlie Rose, Danny Masterson and many others. You can check out a video of the conversation between John Oliver and Dustin Hoffman, courtesy of The Washington Post, for yourself below. You can also check out tweets from Steven Zeitchik, who wrote the story for The Washington Post and was in attendance at the event. And now the _ audience _ is arguing volubly back and forth about whether Hoffman is upstanding and Oliver should be asking the questions. Not sure I've ever seen anything like it at a screening panel. Oliver just asked people to stop recording his argument with Hoffman on their phone. "That's what I hate about the Internet." But i mean, isn't that why he brought it up? To have a public conversation?